Hope you're all doing fantastic! I made this creation over the weekend and it really shocked my tastebuds with how good it tasted. Something about the homemade vegan ranch dressing with the crispy flavoured tofu and the fresh crunchy veggies. For the vegan ranch dressing I can't take credit for it as it's from this blog (click here) but I've listed the recipe below. Also, you'll need a high powered blender and soaked raw cashews along with a few other ingredients. It's so easy to make and it's very versatile for other salads or even as a dipping sauce! As for the crispy tofus, these were my favourite part about the salad. So flavourful and CRISPY! For this recipe, I'm using Soyganic non-gmo organic extra firm tofu. Well I hope you give this recipe a shot and let me know what you think in the comments. Please share this recipe with family and friends if you enjoy it. Soak raw cashews in a jar in hot boiling water for 30 minutes. Time Saving Tip: Soak cashews overnight in cold water in a jar and store in fridge. Reserve 1/2 cup of the cashew. Pour this into the blender along with the other ingredients and blend until super smooth. Transfer to a reusable squeeze bottle. Prepare your vegetables as listed above and arrange them onto your plates as the base for your salad. Optional: You can fry the bell peppers in some oil and salt over medium heat until soft. In a medium size bowl, combine all cornstarch, garlic powder, chilli powder, salt and pepper and whisk together. Add in the diced tofu and coat each piece. Then in a non-stick pan set on medium heat, add avocado oil. Then add in the diced tofu and fry on both sides until golden brown. Approximately 5 minutes on each side. 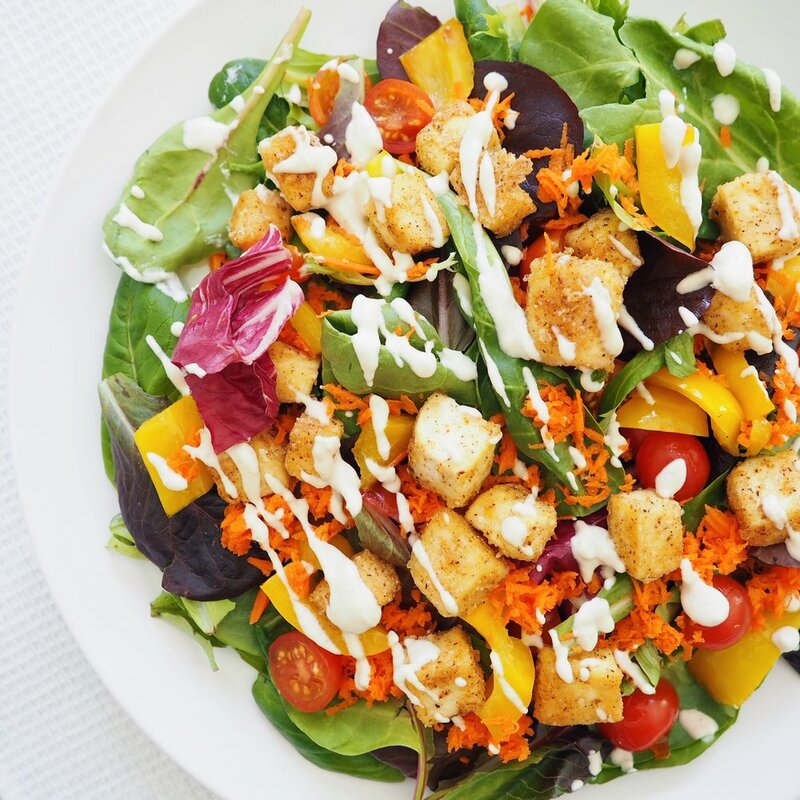 Add desired amount of crispy tofu and ranch dressing to your salad. Serve immediately and enjoy!